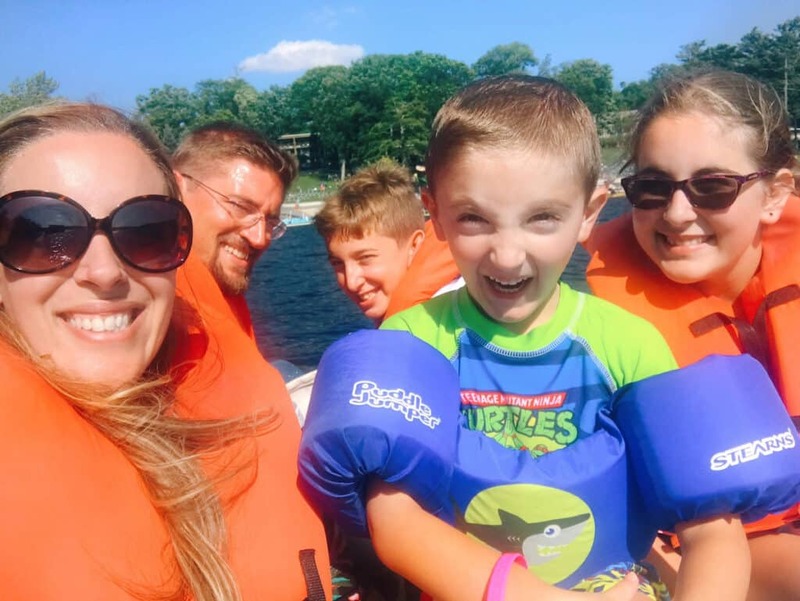 Over the summer, my family spent a few days at Woodloch Pines Resort and I have to be honest with you – we had the most incredible time ever. As I went back to edit these photos for this post, I almost started to cry. I was flooded with such special memories. I am a nomad. I cannot STOP traveling. I wake up dreaming of my next vacation and typically, I never return to the same place twice. That’s just the way that I am. But there was something truly special about Woodloch Pines. And you know what? I can tell you what it was. It was simplicity. It was an old-school mentality. A trip into those mountains became everything that I wanted my family to experience and more… and I cannot wait to return. I’ll do my best to sum up all that Woodloch Resort has to offer, but you literally need to experience it on your own. In fact, you should head on over to their site to check for upcoming availability right now. Work through your calendar and seriously fit it in. You will be THANKING ME LATER!! 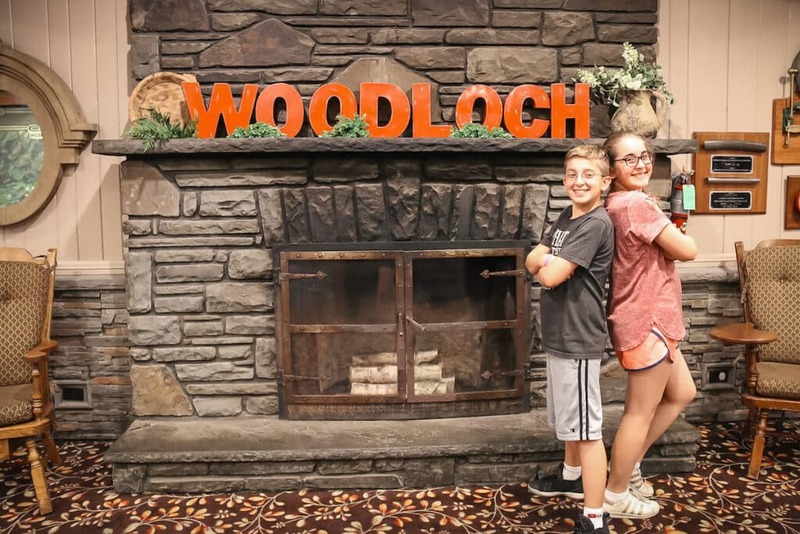 Here are just a FEW of our favorite moments from our Woodloch Resort family vacation. And believe me – it was a vacation. You know when you go away and the entire time you’re completely stressed out and yelling and rushing and miserable? Yeah, it wasn’t like that. We were beyond CHILL and RELAXED and HAPPY. I was in my glory on this vacation. The children felt the same exact way. They were BEGGING TO RETURN WHILE WE WERE STILL THERE. It was hilarious. I promised them that we would get Grandma to take us all back next summer to celebrate her birthday. I’m sure we can work that out. LOL! Grandma – did you read that? 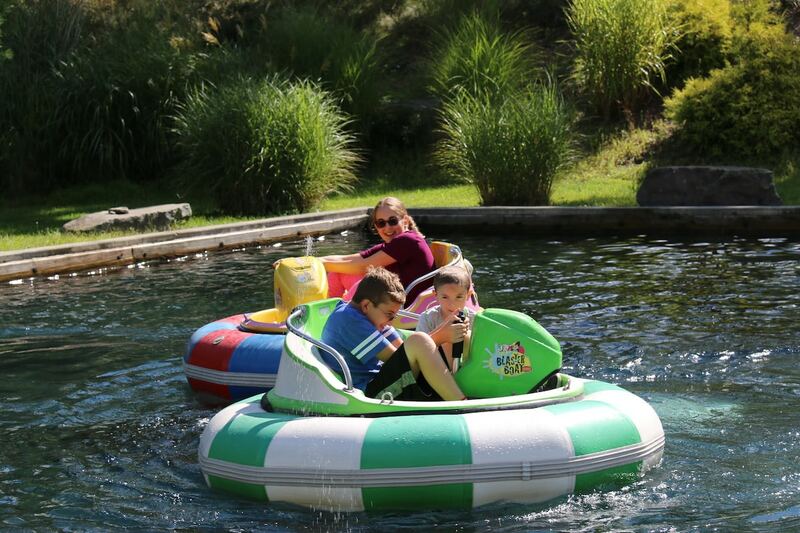 At Woodloch Pines, there are so many options that when you first arrive, you might feel a tad bit overwhelmed. Fear not! You will be able to squeeze it all in. The first thing my family did was head on over to the lake to check it out. We are city folk. My husband and I were both born in Manhattan and raised in Queens. There were no lakes!! So, it’s always a pleasure when we find ourselves surrounded by nature. Even 40 years later – it feels like magic to me. Quiet and calm and absolutely stunning. After we checked in, the kids played a bit by the water while we watched at the edge of the sand. The lake has so much to offer. It’s not just about swimming! Eventually, we all grabbed our suits on and jumped in a boat to explore the water on our own. There are life vests available for everyone to use which was such a convenience. Do you like to fish? Well, great news! You can buy everything you need right on property! Even get your fishing permit with a click of a button. We did NOT fish but saw plenty of people enjoying the calm waters and their favorite past-time activity. 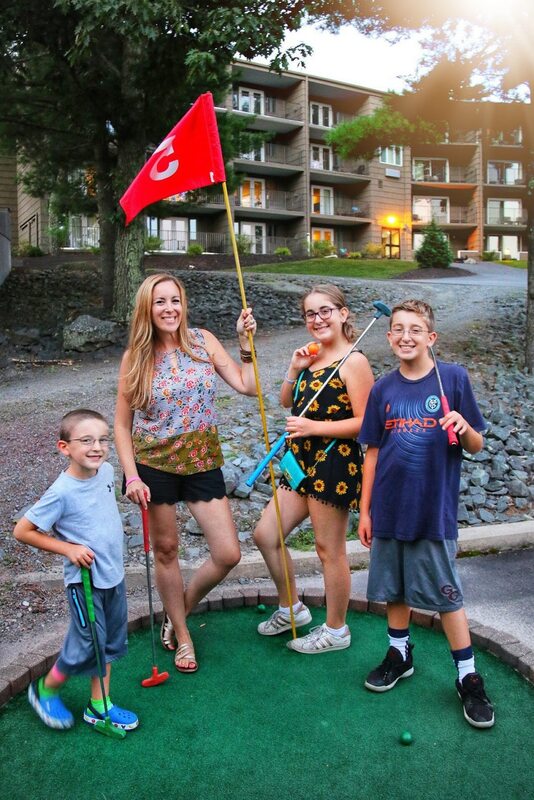 Woodloch Pines becomes exactly what you make of it. I have to be honest with you – I’m one of those people that wants to know what is going on at all times. Yeah, I said it. Give me a highlighter and a calendar and I am GOOD TO GO! Well, I LOVED WAKING UP EVERY MORNING and heading down to breakfast to find…. 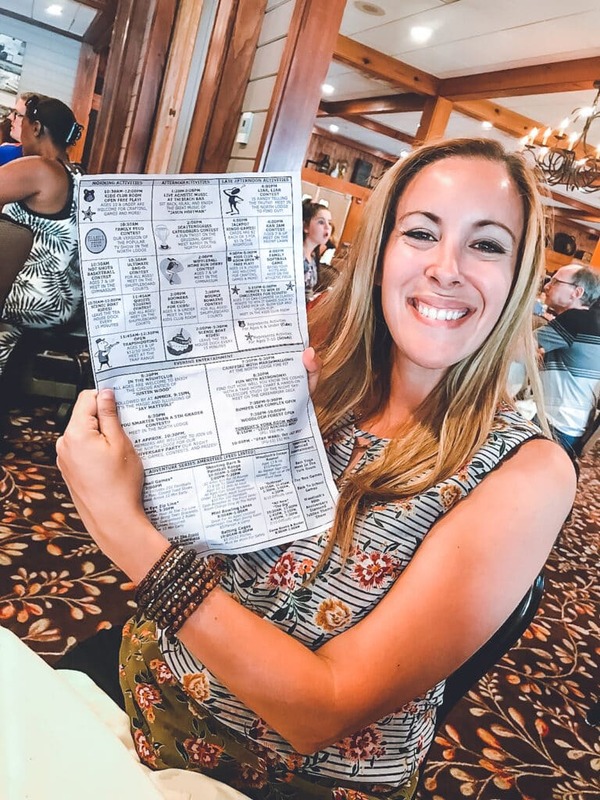 A DAILY SCHEDULE OMG CAN YOU STAND IT THANK YOU WOODLOCH PINES! (phew – deep breath). The kids would all chow down on the morning’s sweet treats and I would dive right into the special activities for the AM. OBSESSED. I have to stop screaming at you. I am sorry – but this was a big deal for me. We literally tried to do as much as humanly possible every single day. Made a little game out of it. LOL. Your schedule will be waiting for you at breakfast every morning. You can take it with you and pick and choose what you see fit. Or you can stroll and wander and stumble upon whatever feels right. Totally up to you. There are daily specials and there are Woodloch staples. So, believe me – you will have plenty to do! 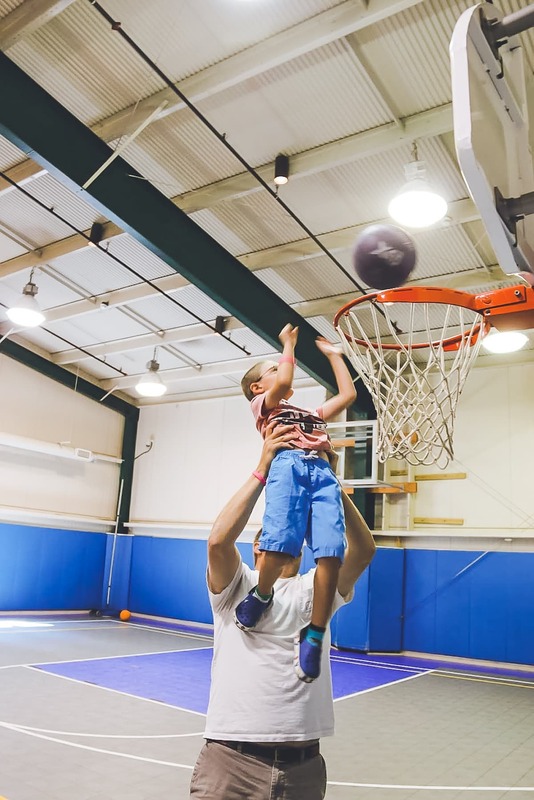 playing basketball. What a fun place, right? They had hoops lifted to all different sizes which were great for kids of all ages. Plenty of balls to choose from. 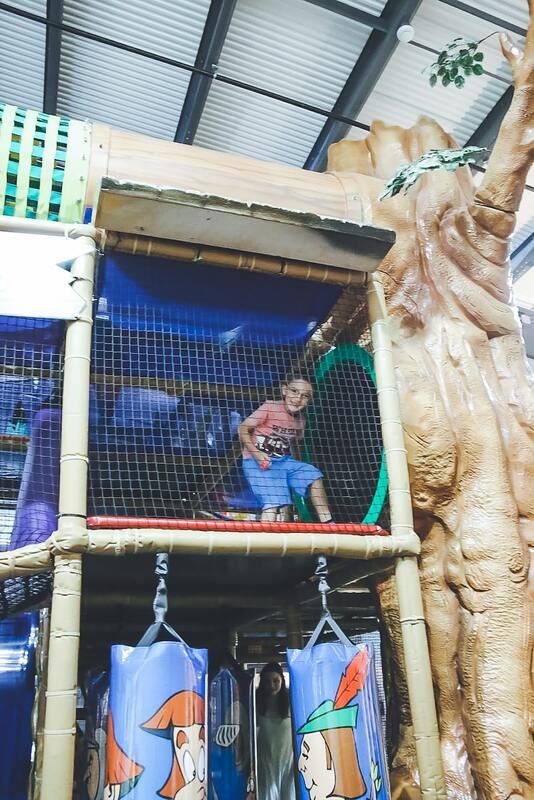 This little area kept the kids occupied for a while. On the first floor, there was an arcade. We didn’t spend any time in there because you had to pay to use the machines, but just an FYI for you guys. 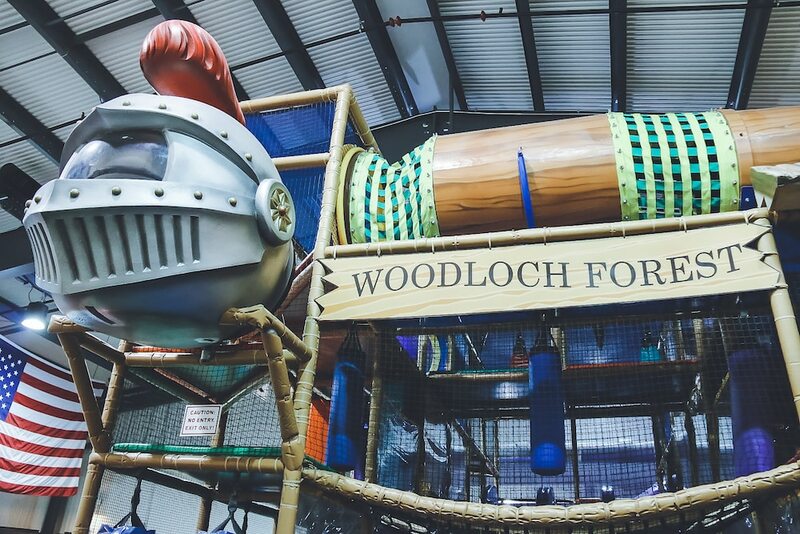 It exists just in case you need to kill some time during bad weather at Woodloch Resort. 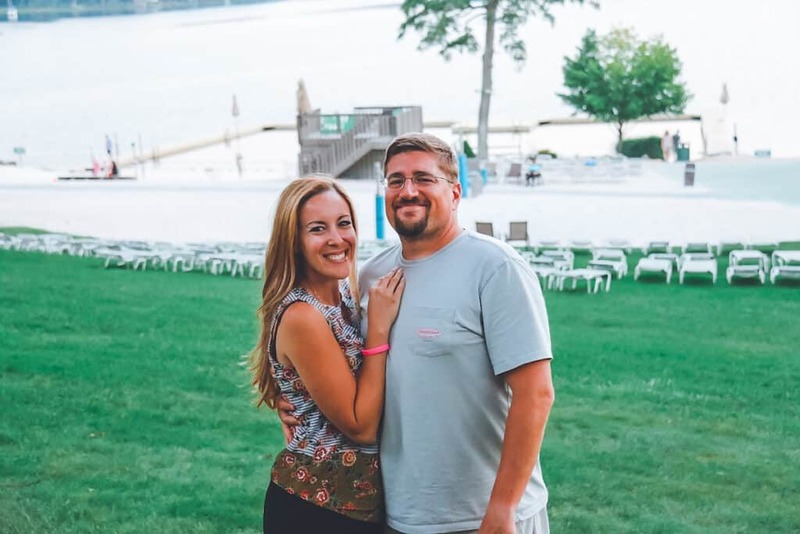 And Can We Talk About The Food At Woodloch Pines Resort? When I heard the food was included during my stay I had low expectations… to say the LEAST. All inclusive food is typically… not the best. BUT I was SO WRONG! Woodloch Pines dining was outstanding. Every meal – this is not a joke. And you know what? Mom to mom – because the food was all inclusive, I made my kids try everything and it really worked out. They explored foods that they have never tried before. We had a culinary adventure and they are better off because of it. 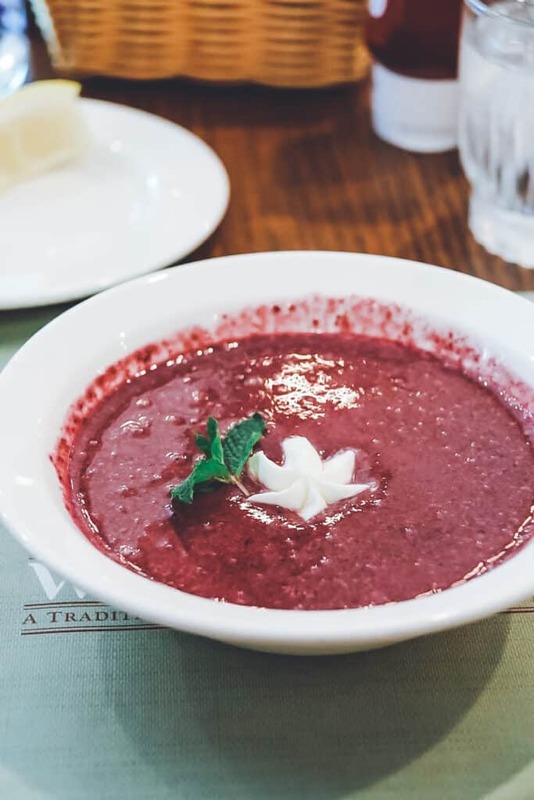 I could have never gotten any of my children to try chilled raspberry soup at a restaurant because I would never spend money on something like that for them. I wouldn’t take that kind of chance. You know what I’m saying, right?? Well, guess what? All three of my kids devoured this course! I was so happy! Now, we can add another type of food to their list of things they eat. YAHOO! My husband kept asking for details on every meal. I had to eventually make him stop harassing the waitress for an ingredients lists. It was that good. I am not overselling this – I promise you. We are foodie snobs. Understand this. Food matters. 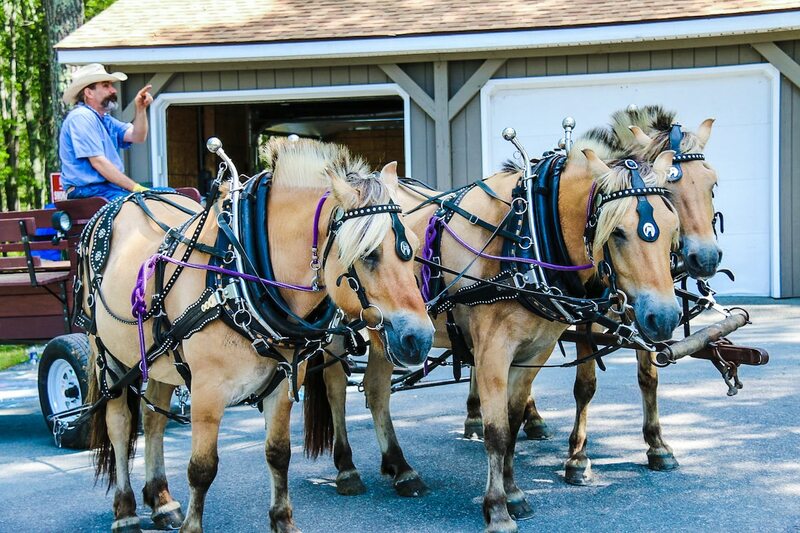 And at Woodloch Pines you will not be disappointed. GREAT dinners – every night! Delicious lunches and hearty breakfasts!! Beyond thrilled with our dining experience. 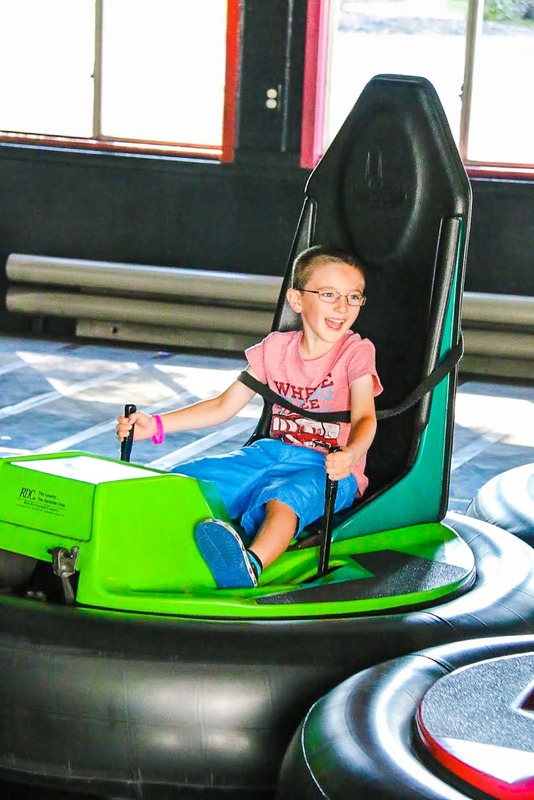 How many times did we go on the bumper cars? 1,000,000,000 times – that’s how many! There’s only one place that we liked more and I will get to that in a minute. 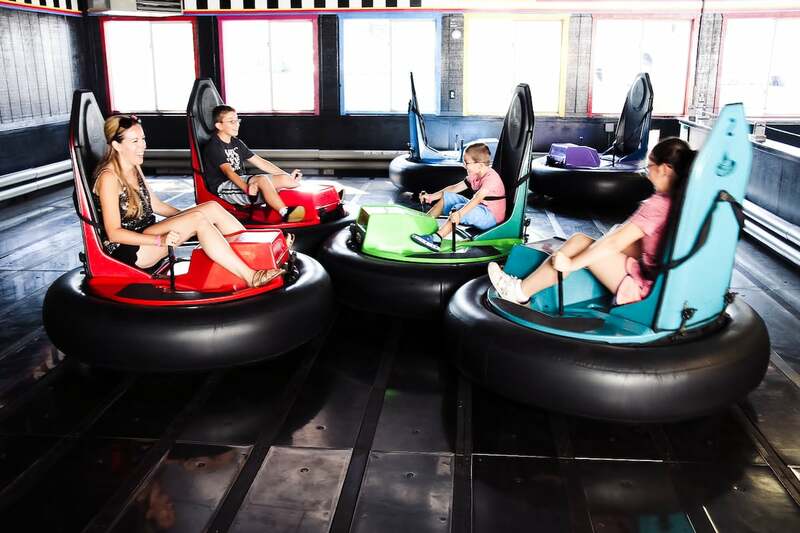 Now, here’s the thing about the bumper cars – I take no prisoners and neither did any of my family members. So, when it was our turn, we put on a SHOW. I hope you do too. Lots of laughs. And those laughs are still talked about to this day. We have so many private little jokes from this trip. 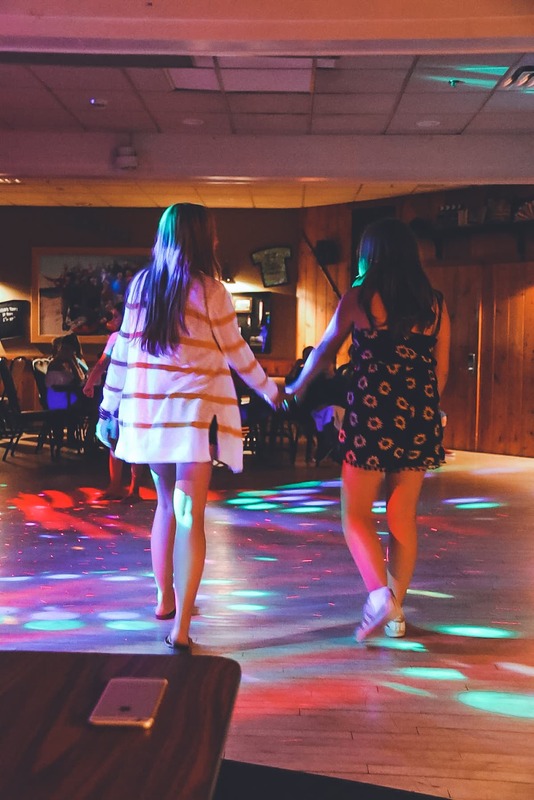 So many laughs, memories, one-liners, instances that we refer to – more than any other place that we’ve been to in the past. This made me really analyze WHY that would be. It’s because we spent the most time TOGETHER on this vacation. We weren’t wasting time doing other things. The entire trip was just being together. 100% bonding. You know when you go to an island and the kids spend 80% of the time in the water and you are on the sand? But you are still away together? It wasn’t like that here. We were together 100% percent of the time and it was lovely. Truly lovely. We did every activity together and I wouldn’t have it any other way. I haven’t even shown you the room yet! What am I crazy? 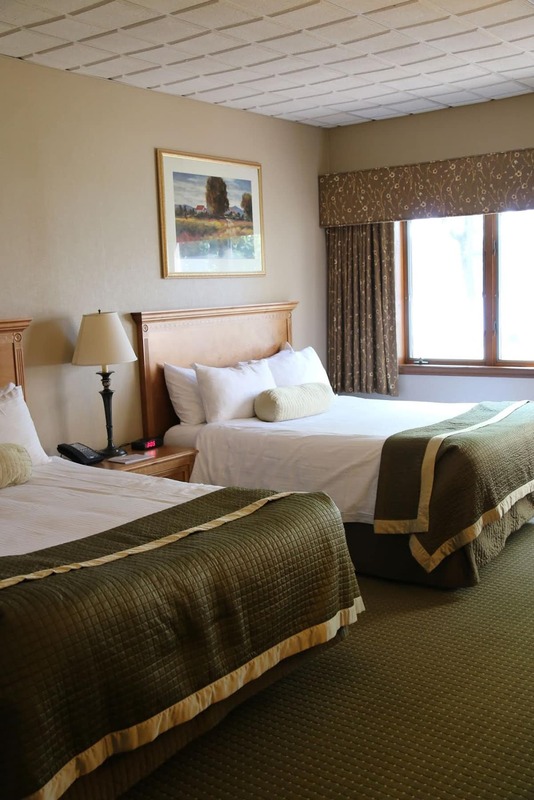 Here is a quick video showing you what a typical Woodloch Pines hotel room feels like. I always like to search for these videos before I head on out for a trip. Watch as I literally walk through the entire space to give you a good feel of what your family would feel like in one of Woodloch’s suites. The entire lot is pretty spread out but it is walkable if you want. We ended up using their bus service that runs all day and is free. You just wait outside of wherever you are and within a few minutes, transporation arrives and makes stops all throughout the resort. If we ever needed to get back to the room for whatever reason, we would just hop on the mini bus and we would be back within 10-15 minutes tops. Ok, guys. The magic shows were cute. Really cute. 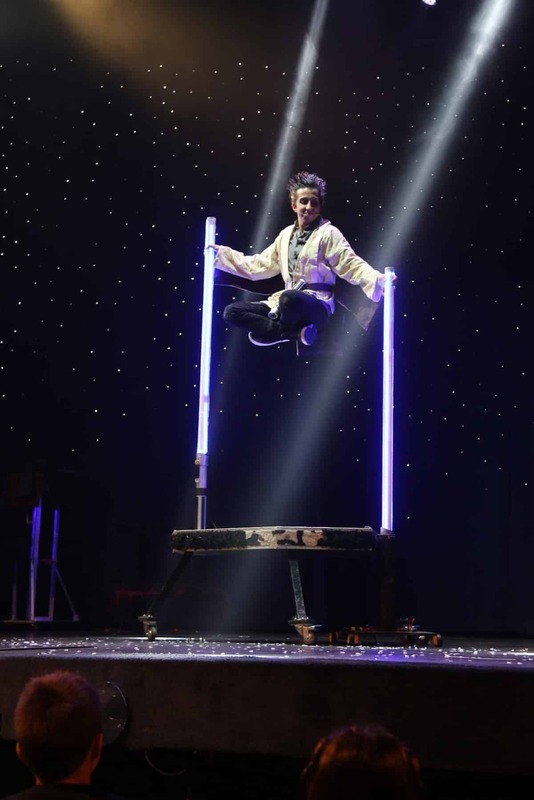 The kids were absolutely amazed and if I am being REALLY honest with you, I was even occasionally blown away. Really good stuff happening at Woodloch Pines. Not Vegas style! Don’t get it twisted! But it was enough to bring on a few belly laughs and several gasps. What more do you need from a Wednesday night? Kids are even pulled up on stage and brought into the show. Natalie was one of them! Super fun. You know she was beyond thrilled. Really great way to spend time with the family. Like I said, this entire trip my clan bonded – in a serious way. In ways that we haven’t bonded in years. 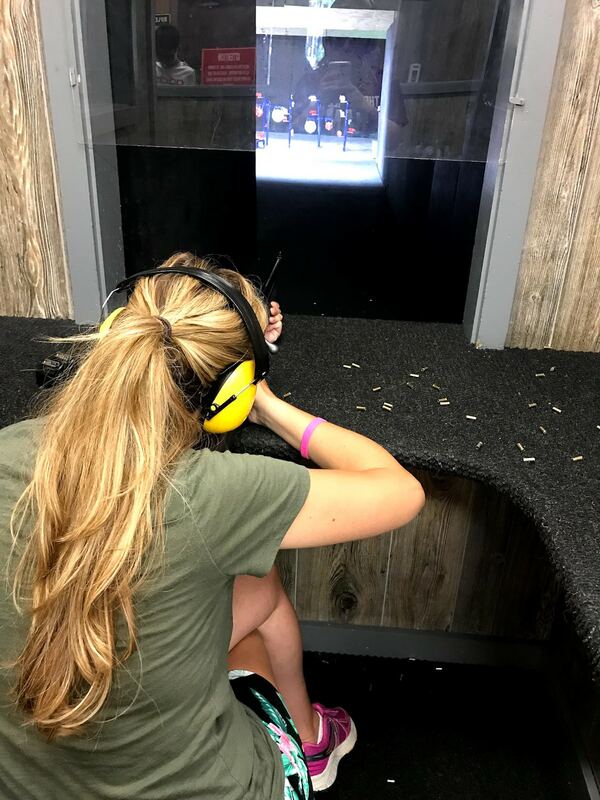 It was like therapy! I don’t know how else to say it. We hit the reset button, folks! It was just what the doctor ordered. 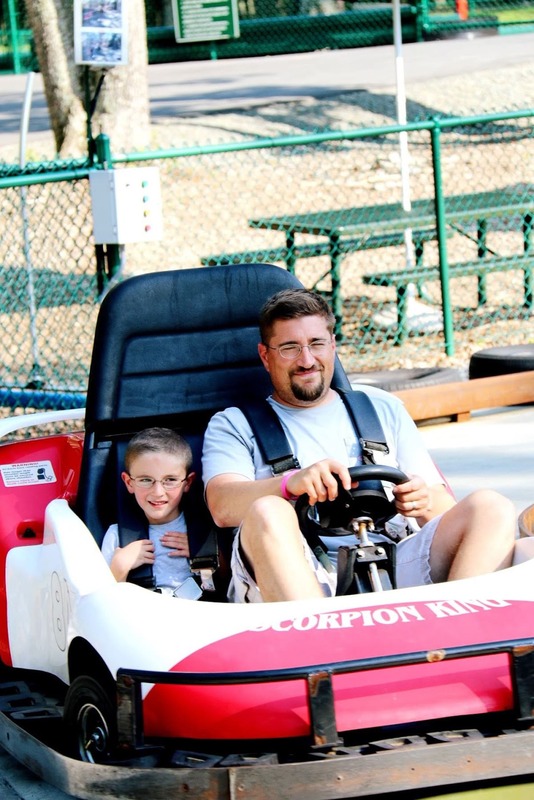 Two words – Go Karts. I mean, come on!! So much to do and I am not even showing it all because how long are you going to stay on my blog to read about my vacation??? 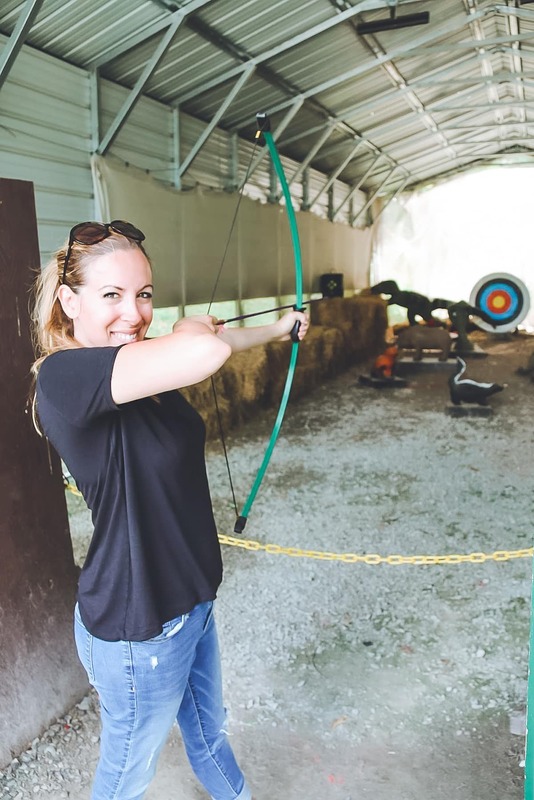 You just have to go on your own to experience the zip lining and the escape rooms and the… well, I don’t want to spoil it all for you. 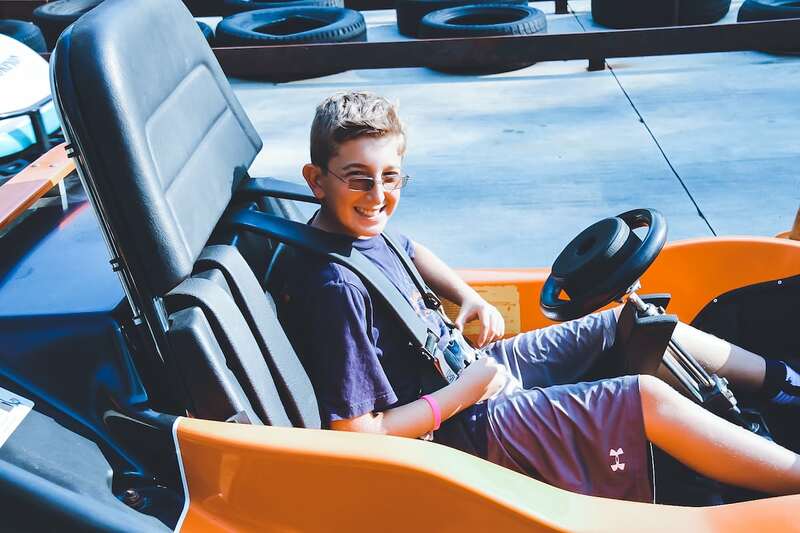 Woodloch Pines is just FILLED with SO MUCH TO DO. Your family vacation is going to be an adventure like nothing you’ve ever seen before. I am so thankful that we were able to take our children there for several days. We now know that we HAVE to return. We just HAVE TO! It was one of our favorite vacations to DATE. Did I mention the SPA? That will be for another post. Stay tuned for more. 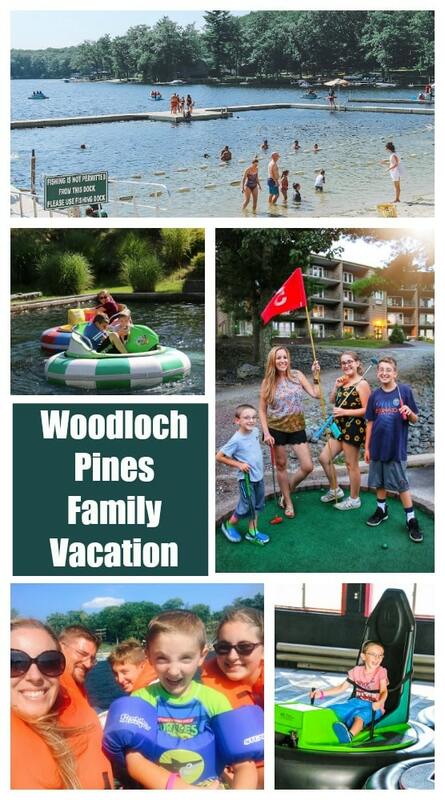 To learn more about Woodloch Pines Resort, visit their website. Are you looking to start planning your next getaway? Here’s a chance to win $25 to get you started. Use the form below for your chance to win. Best of luck! 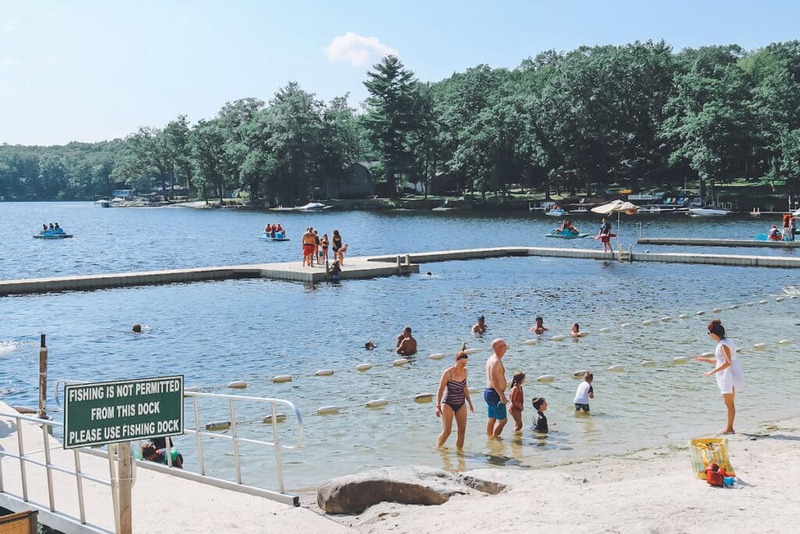 *Woodloch Pines comped my stay in exchange for this review. All opinions are my own. We’re on a family vacation right now! I went on a family vacation this summer in July. Its been 4 years since we had avacation! We went on a lake staycation this summer but nothing major. We live in FL and have Disney annual passes and take mini vacation every month or two! We haven’t taken a family vacation in a couple of years. Since the kid is out of the house at college, hubster and I took a trip to the Alabama coast and chartered a boat. I caught a 5 lb speckled trout! Overall, we caught 9 fish! Great, quality time. We are planning a week long bday trip next month! We took a family vacation this past summer to the beach. 14 years ago my son had a heart transplant then so we havent been since then. We took a family vacation a few years ago in the summer. We took a family vacation this summer with our kids. We visited the Ark encounter in Kentucky and loved it. We are planning to go to NYC in the Spring! It has been about 7 years since we took a vacation of any kind! Vacation? What is it this vacation thing you speak of?? Our last family vacation was 2012 when our whole extended family rented an 11 bedroom lodge at Blue Lake. There were 25+ of us. We are planning a tip to NC next month. We love road trips! We took a family vacation this past summer. We visited family overseas and also took a vacation at a resort. So we haven’t taken one in a while! But we will, hopefully soon! This place looks amazing for sure. We took a vacation in June. We took a vacation about 4 years ago. We took a vacation this past August. We took a trip to Santa Fe in August and saw the opera. The last family vacation we took was in May (Florida), and we should be visiting family in Chicago soon. Are planning a bday trip for my hubby to Orlando in a couple of weeks. We took a road trip from SC to Long Island in August. I took a vacation 1 year ago.